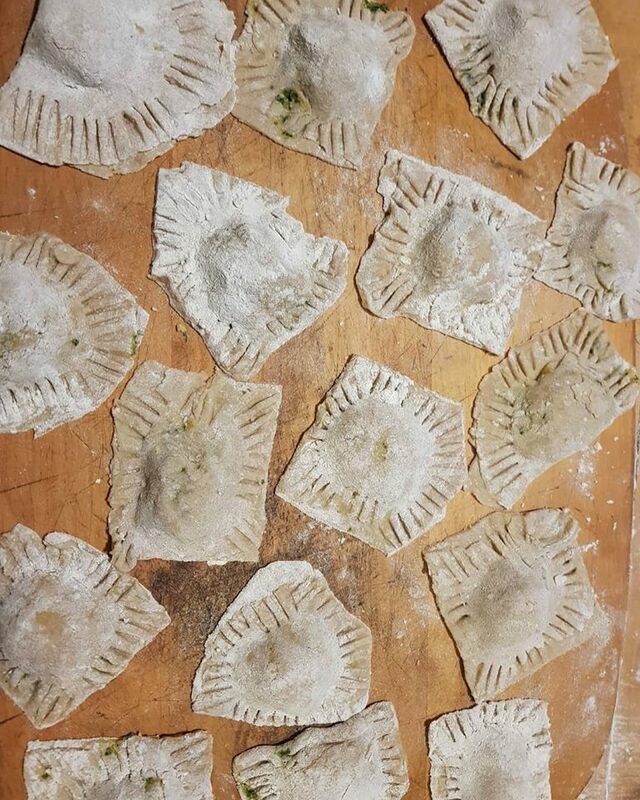 Home made ravioli is wonderfully simple. Ignore anyone who tells you that you need fancy equipment or ingredients – seriously. They are not helping you live your best life. This is how we make ours. First we make a pasta dough – read how we do this other really simple process here. 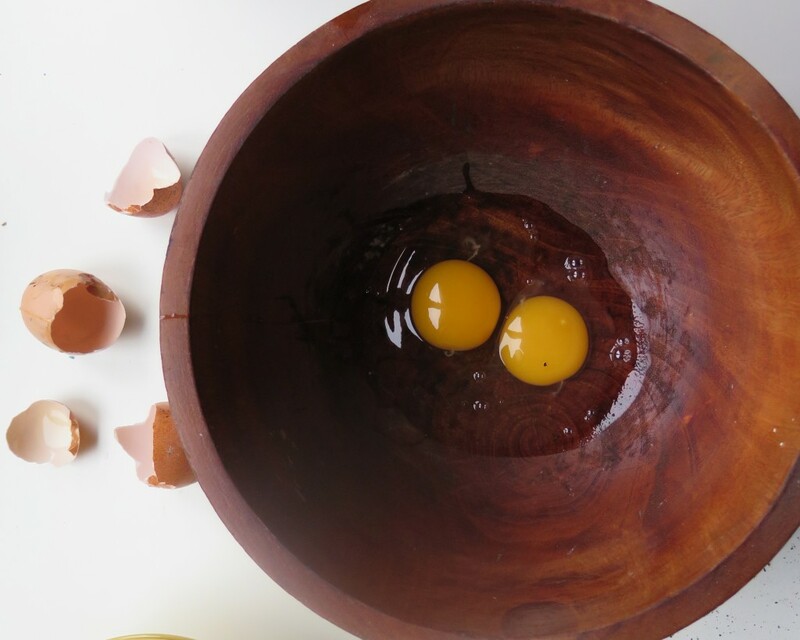 Pasta dough is simply eggs and flour – these days we use 100% buckwheat flour. While the dough’s resting in the fridge we make the filling. This can be pretty much anything you like. For this batch we made the filling from roast pumpkin, goats fetta and wild greens – all from the garden. Importantly, we whizz the ingredients all up together as this helps them bind and the whole package is less likely to fall apart. Some people do a meat based filler, others vegan – anything will work as long as it has good moisture content and isn’t too bulky (hence whizzing it up). Put the mixture to one side while you get the pasta dough back out of the fridge (where it’s been resting for at least 20 mins). Roll the dough out until its around 2mm thick (or thinner if your dough can handle it). 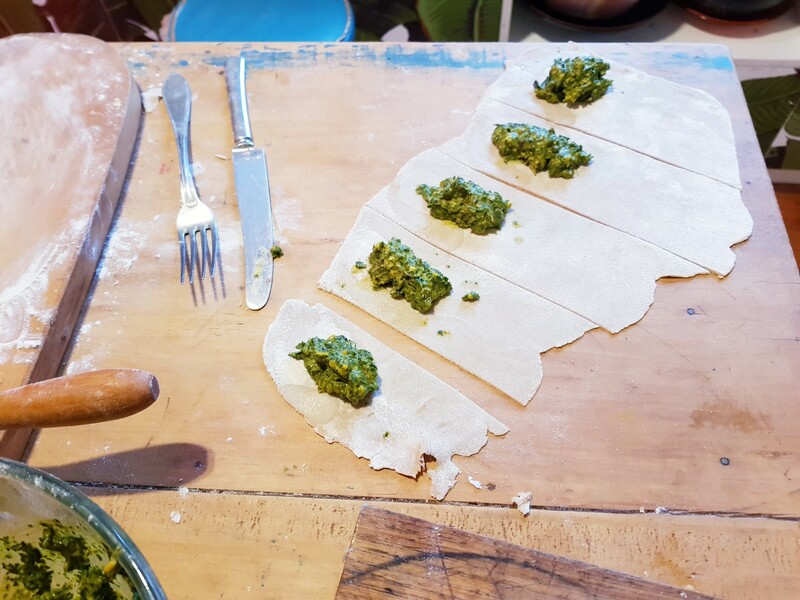 You can roll it through a pasta machine if you have one, or just roll it by hand with a rolling pin (a wine bottle also works brilliantly). Lay the sheets of pasta out on the table and cut them into rough sections with a butter knife. They don’t have to be exact at all – in fact the roughness of the shapes is part of their beauty. Next up, put a big teaspoon’s worth of filling onto each section as shown below. Have a cup of water nearby so you can dip your fingers in and gently moisten the edge of the pasta around the filling – not too much otherwise it’ll desolve into a bad mess. Then you can fold each pasta section in half and press down the edges with a fork so it binds together – and looks pretty. Now you’re ready to cook them. Bring a big pot of water to the boil and plop them all in. They’ll automatically sink when you first put them in, once they float (after a few minutes or so), they’re ready, Strain the hot water off them and eat immediately with your favourite tomato or herb sauce. Yes, it does take a bit longer than buying instand pasta or ravioli, but the taste will ensure you never go back. Life is too short for crap food.